Karnataka, home to the country's startup capital, Bangalore, cemented its position as the region attracting the highest amount of venture capital and overall startup funding in 2016. The southern state recorded $341 million in total announced value of startup investments across 201 deals this year, according to VCCEdge, the data research arm of News Corp VCCircle. Of the total, venture capital transactions accounted for $297 million across 61 deals. Clearly, when it comes to signing big cheques, Karnataka remains a favourite among VC firms. The national capital of Delhi and its adjoining areas came next when it comes to startup funding, with $278 million across 254 deals. 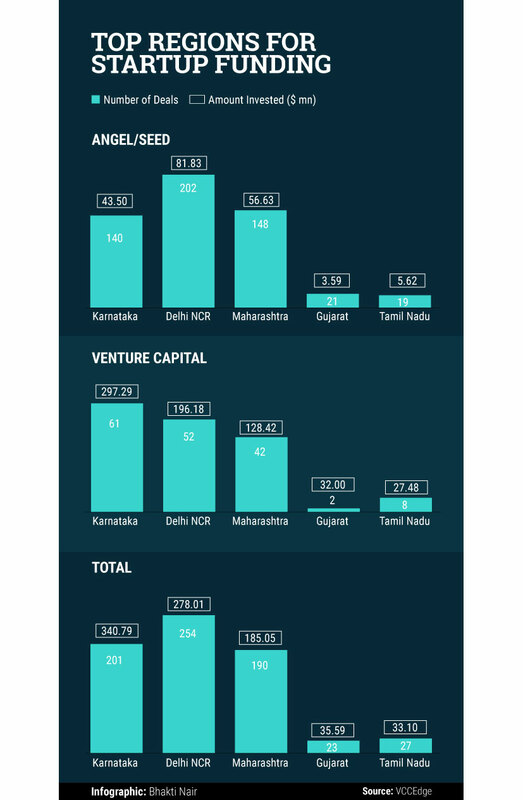 However, Delhi-NCR took the top honours for angel and seed capital, registering $81.83 million across 202 deals. Maharashtra came in third, with $185 million across 190 deals. Gujarat and Tamil Nadu were a distant fourth and fifth. Overall, the trend remains largely unchanged from 2015 .